Seven weeks of having visitors was really really nice. I have had an amazing time with them all and I have spent a lot of time planning and looking forward to it beforehand, however, I must also admit that (now, almost two weeks after my mum left) it was pretty nice to be back to normal. It was of course all planned around this lovely event, or actually our wedding came about because everyone were coming to visit, not the other way around! We knew that Langkawi Regatta was in the middle of January, so we allowed ourselves one week after the regatta to catch up on work, and then my twin sister Karen arrived. Actually she's a super cool mum, she flew here alone with three kids aged 2, 4 and 5! Week 1 & 2: Phil slept on a couch at the loft and I sailed Karen and her three boys to Ko Lipe (Thailand). Week 3: Karen's boy friend arrived and they stayed in an apartment in Kuah. 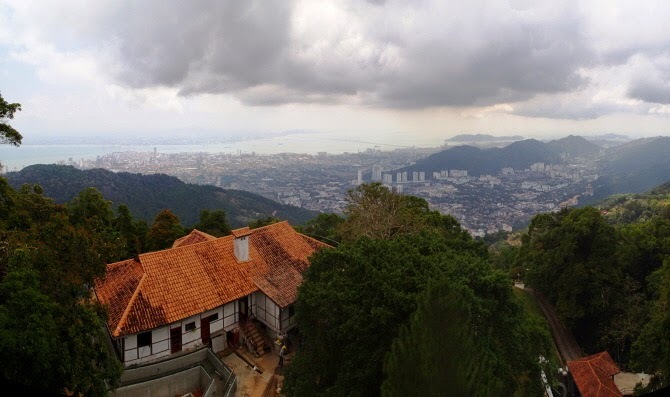 Week 6 & 7: My mum stayed on after everyone left, we hung out in Langkawi, cruised a bit, and visited Penang and Kuala Lumpur. Here we go, 28 photos of lots of fun in seven weeks. Now in Ko Lipe, we stayed in these three huts right on the beach and a couple in behind as well. 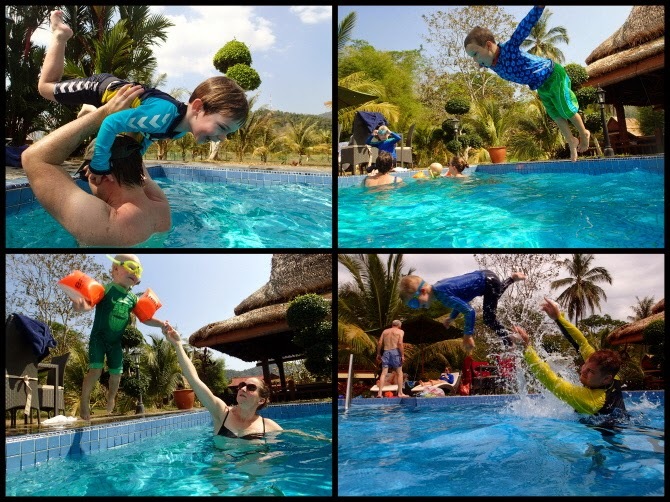 Holger age five improved his swimming skills immensely after five weeks and at this stage was able to snorkel with his dad for 45 minutes with no inflation help and he even dove to 2-3 meters!!! I love Penang's architecture, here's an example of a traditional airwell in an old shop house, now museum. Surprise - Phil and I got married on February 16 2015! We have been together almost six years, and I'm sure if you counted that in boat years where we're together 24/7 it would be closer to 20 years, so it's not really a huge deal and there wasn't a romantic proposal leading up to it, but we ended up having the most fantastic day anyway. Even our parents agreed that it indeed was the perfect way for us to get married. Being a mixed couple from opposites ends of the world it would have been hard to choose which country to get married in. Seeing that we now live in Langkawi and that our families were coming to visit anyway, it was the natural choice. One day when we're back in NZ (where most of our common friends are) we'll do a big party. If you dream of getting married in Malaysia, have a look here for the government guideline on the paperwork requirement. It is quite a crazy amount of paperwork, eg our certificates of no impediment to marriage had to be certified by each our embassies in Kuala Lumpur, then two more departments in Putrajaya. We visited the local KDN office and the nice lady there in charge of wedding registrations explained the process to us, but then also recommended an agent who does all the paperwork. It wasn't cheap, but saved us a lot of time, travel and hassle. We didn't want celebrant who doesn't know us saying words to us, so we opted to keep it simple and just sign the paperwork and say our own wows and that was it. Simple, casual and relaxed was our style. My dress was from H&M and we were barefooted (as you are on a boat!). We did choose a most fantastic venue: Naga Pelangi is a traditional Malay schooner, 72 feet long and featuring a lot of lovely wood. Christoph and Uli and their crew are fantastic hosts and they really made our day special. 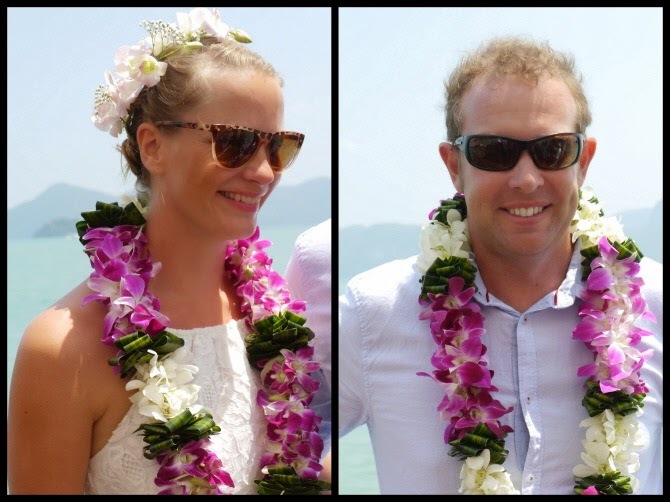 One example: when we arrived onboard, they gave Phil and I beautiful flower leis! Langkawi itself is also the most spectacular venue, gorgeous lush green and cliffy islands set in tropical waters! I'll let the photos speak for themselves.